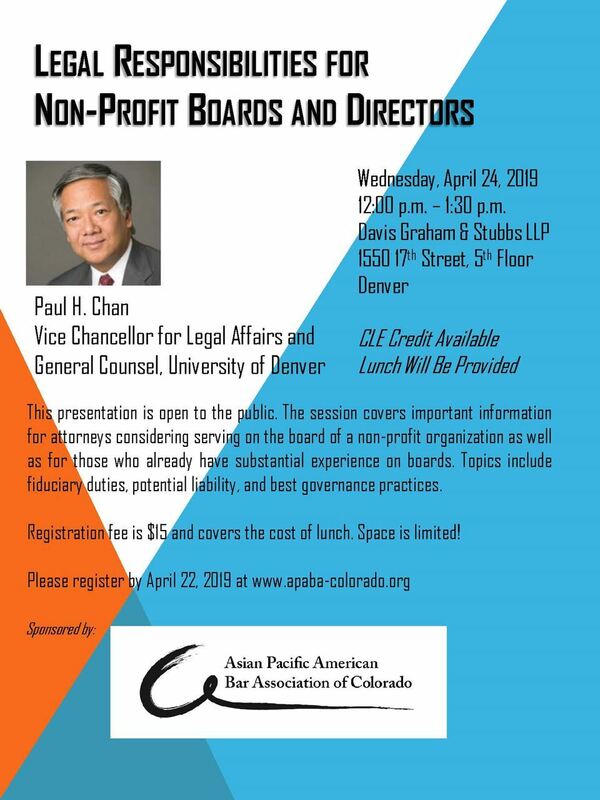 Paul H. Chan, Vice Chancellor for Legal Affairs and General Counsel for the University of Denver, will present the Spring CLE Program covering legal responsibilities involved in serving on a non-profit board. The presentation will cover important information for attorneys considering serving on the board of a non-profit organization as well as for those who already have substantial experience on boards. Topics include fiduciary duties, potential liability, and best governance practices. CLE credit is available, and lunch will be provided. Questions? Please contact Kevin Teng at Kevin.Teng@dgslaw.com.